Today was the day that I realized my children really do pay attention and watch what I do everyday. When I see my 5 year old pack a pretend gym bag and say she’s heading to the gym or to have my 7 year old ask to follow me on his bike why I run makes me more proud than ever. My 5th grader had “Dress For Success” today at school where kids were able to dress up like their parents for the day. My daughter asked for my YMCA shirt this morning and my badge because she wanted to go to school today as ME! I just gave her the biggest hug and said “thank you!”. This was such a humbling moment and I am very grateful to be able to give my kids the most amazing opportunities and be part of the YMCA family. I may feel as though my work/life balance is never truly balanced but to have my daughter want to be me for the day at school made me realize that they love having the Y in their lives. They don’t mind that I’m busy or that they have to come to work with me for a few hours. They love it and they want to be part of it. To hear my daughter talk over dinner how she is going to be a lifeguard or camp counselor at the Y when she is old enough to work made me realize that as a parent I am doing something right. 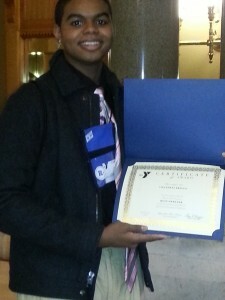 Thank you YMCA for everything that you do! The term “This changed my life” gets thrown around quite often. Some use it to describe meeting their wife, or having children, or finally finding that perfect job. Well I can honestly say that The Y changed my life because it allowed me to do all of these things. I always had a crush on Bethany Bottone. Going all the way back to high school when I would see her around and even talked to her for a semester when we had a study hall together. But in terms of baseball, she was playing for the Red Sox and I was striking out in T-Ball. Then she graduated a year ahead of me and went off to college a year before I did. 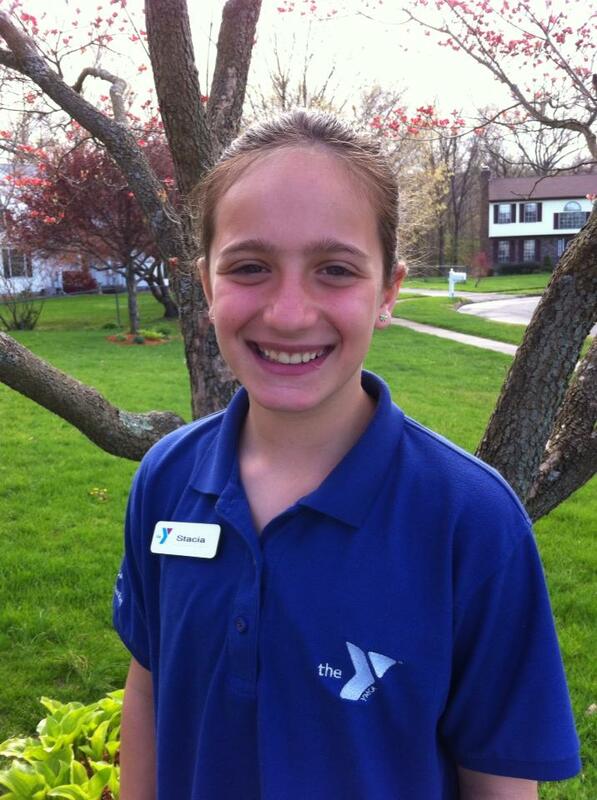 During the summer I worked at YMCA Camp Sloper in Southington, CT and then at the Southington YMCA during the school year running before and after care programs. Bethany was busy at college in Washington DC and spent semesters traveling the world. So again, she’s the Sox and I’m not quite sure where shortstop is. Then in the summer of 2002 the YMCA brought us together. I had been a counselor for three years and was tapped to run the high ropes course that summer. Bethany, who showed up to staff training straight from Guatemala, appeared at my station to learn how to properly put on a harness. I don’t remember what I said because I’m sure it sounded mostly like “Blah, blah, bley, blibbity, blah.” I just couldn’t believe that I had to now teach this person, whom I could barely talk to, how to properly use a device that is used to keep someone safe. Well, I guess I made an impression on her because we’ve been together ever since. 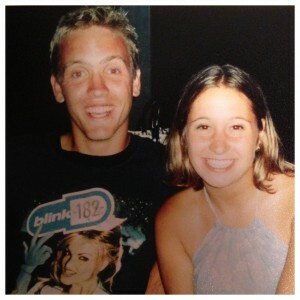 Four years passed by quickly, and we were engaged on the first day of summer 2006. That summer we were also Assistant Camp Directors at Sloper and continued to be until we had our first child in 2009. Eli August Rosin (of course another summer reference) was born on November 28 and has changed our lives. I know he’s mine, but he’s an awesome kid. He loves animals, climbs everything, and dips all of his food in ketchup. Eli makes me laugh every day. Eli has also become the unofficial prince of Camp Jewell. You can tell Eli is surveying his land when you hear calls of “Eli,” and “Hey, it’s Eli,” and my personal favorite, “Hi Eli’s Mom.” Eli has made me a better person inside and out. I’m not sure if the perfect job actually exists, but I think it’s all in the eyes of the beholder. Take my typical morning here at Camp Jewell YMCA. I have to stand in front of 70 kids and adults and talk. And not just talk, but be creative and funny and make sure that everyone is having a great time while they are here. This could seem like a nightmare to some, but to me it’s just a normal Friday. Then after talking in front of a large group of people it’s on to talking to more people, but the people who I am charged with motivating, inspiring, informing, and generally pointing in the right direction: my staff. Working here at Jewell, the staff is such an integral part of camp that group leaders are always inquiring about them even before they arrive. It makes me proud to be able to work with such creative, knowledgeable, and confident young adults, and I know one day they will stand where I am and probably being a lot funnier than I ever thought possible. So all of this I owe to The Y. It has helped me become a husband, a father, and a leader. 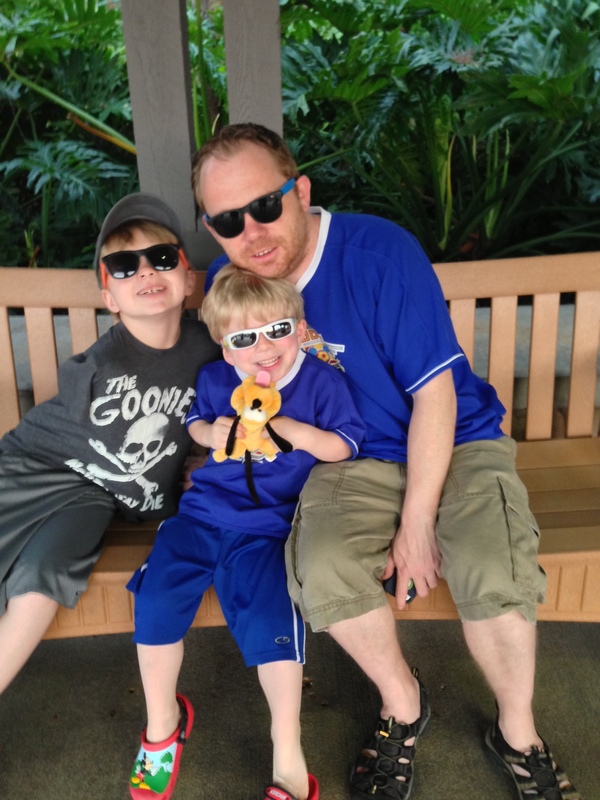 The Y has provided me a niche and a family that I will never take for granted. I don’t know many 31 year olds who have worked for one organization for 13 years, but I’m proud to say I have and I look forward to seeing where it takes me from here. 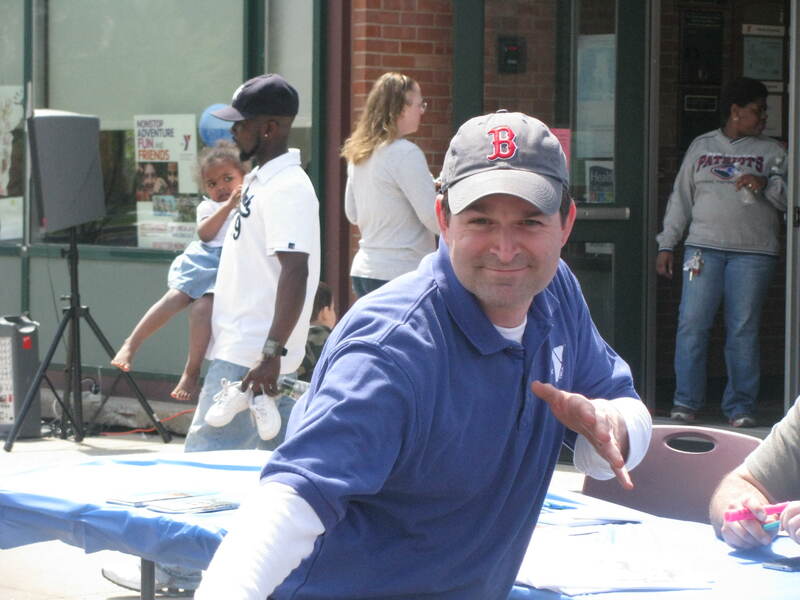 The East Hartford YMCA had a fantastic turnout for Healthy Kids Day on April 27th. Over 270 people attended the event which included two bounce houses, carnival games, program promotion, community vendors and collaborators, a child care art show, 2-on-2 basketball and a family fun walk! Many thanks to my amazing preschool Directors and child care staff for all of their hard work to make this day a complete success. We are truly living our cause! Check out our photos on Flickr (click the link below) to see the great time had by staff, families and the community! 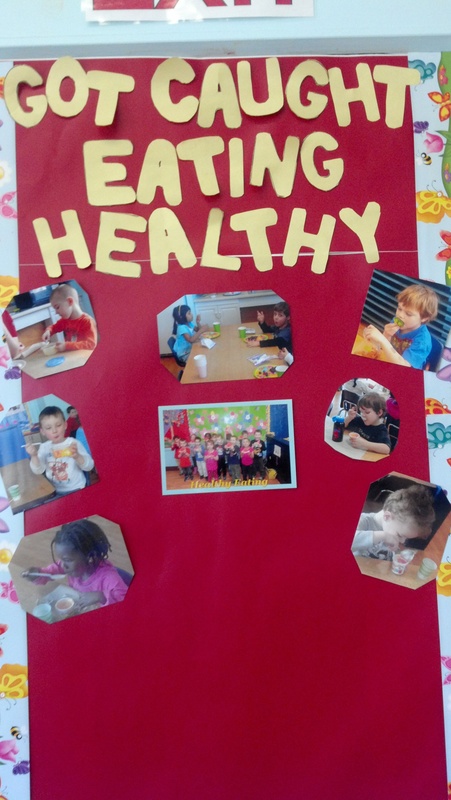 The teachers in our Vernon preschool classroom Tender Care are catching the children eating healthy during lunch and snack time. 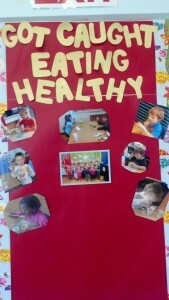 Just another way to encourage healthy eating at a young age! I have been involved in the racing community since my mid 20’s whether it was a 5K, 10K, 1/2 marathon, marathon, mountain bike racing or various triathlons. As a racer, I could not thank the volunteers enough for taking time out of their busy schedules to help the race organizers by checking in all the athletes, handing out t-shirts, setting up the food and answering every crazy question possible. It’s not easy trying to make hundreds of people happy but these volunteers do it and they do it with a smile. I had the chance today to finally become one of those volunteers and stand BEHIND the table handing out the t-shirts and goodies for the eager and excited Color Me Rad racers. Not knowing any of the other volunteers I introduced myself and asked them “why are you volunteering?”. Aggie was the first volunteer that I had introduced myself to. She is from the Hartford area and by asking Aggie “why did you sign up to volunteer?” I found out that she finds a few races in the area each year to volunteer for. She likes the atmosphere and likes to volunteer because it makes her feel really good about herself and that she is helping others. Aggie is an athlete herself and to help those who may have helped her in the past makes it that more special. The second volunteer that I had the chance to introduce myself to was Rich. Rich’s niece was running in the race and Rich’s curiosity got the better of him especially when he heard that people were being bombarded with dyed corn starch. As he researched the event website he noticed that there was an opportunity to volunteer. On his day off, Rich plugged in 5 hours working the t-shirt table with me with the biggest smile on his face. He was like a kid in the candy shop helping out all the racers and answering all their questions. He was hooked! I absolutely loved being part of the volunteer team today. Not only was it special to work with other amazing volunteers with such a passion for helping others, but to help the runners that had fear in their eyes because the Color Me Rad was their first 5K. We were their support team. We were there to help them rid their fears of failure. To put together their goodie bag and send them off with a “Have a great time tomorrow! You’ll do great!” was more than a pleasure and I would do it again in a minute. 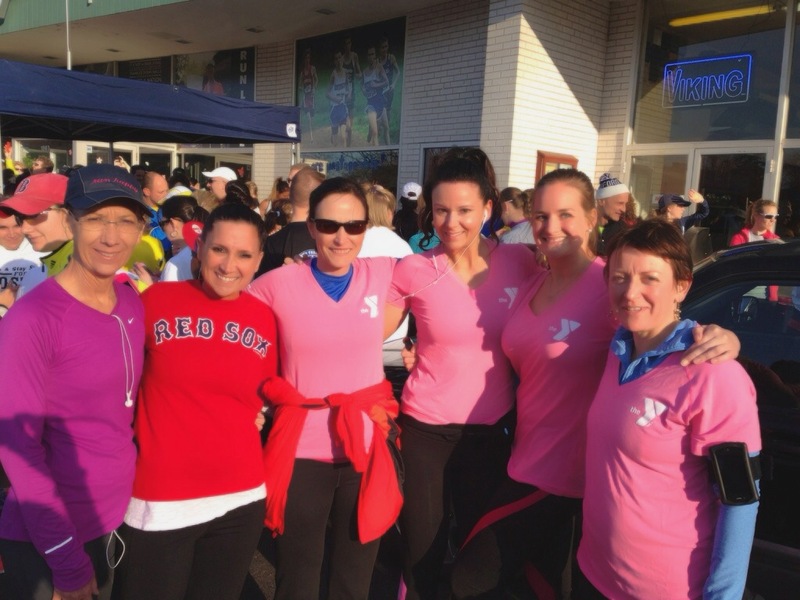 On Monday, April 22nd, several of the women from our women’s running group went out to Fleet Feet in West Hartford, to support those touched by the tragic event that happened at the Boston Marathon. The atmosphere was one of unity and hope. Owner, Stephanie Blozy, organized several different distance fun runs to bring the community together to honor and remember those that were touched by what happened on April 15th. There was also the opportunity for runners to support One Fund, a national fund that was set up to help those people most affected by the tragedy. To date the fund has raised over 26 million dollars to help victims and their families. It was a very powerful experience to be surrounded by members of our own local running community coming together to support each other and such a meaningful cause. 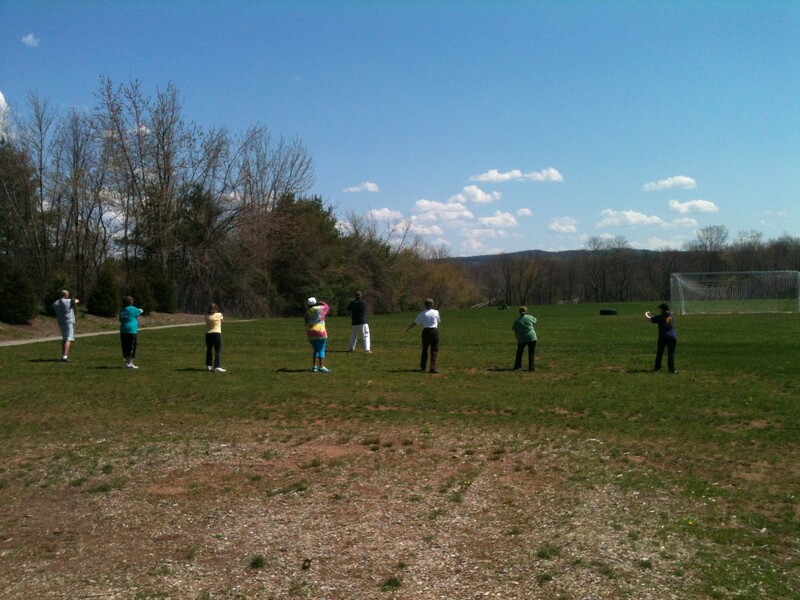 Sunny Tai Chi with Lucky! Not a bad way to spend the morning at the Indian Valley Family Y! 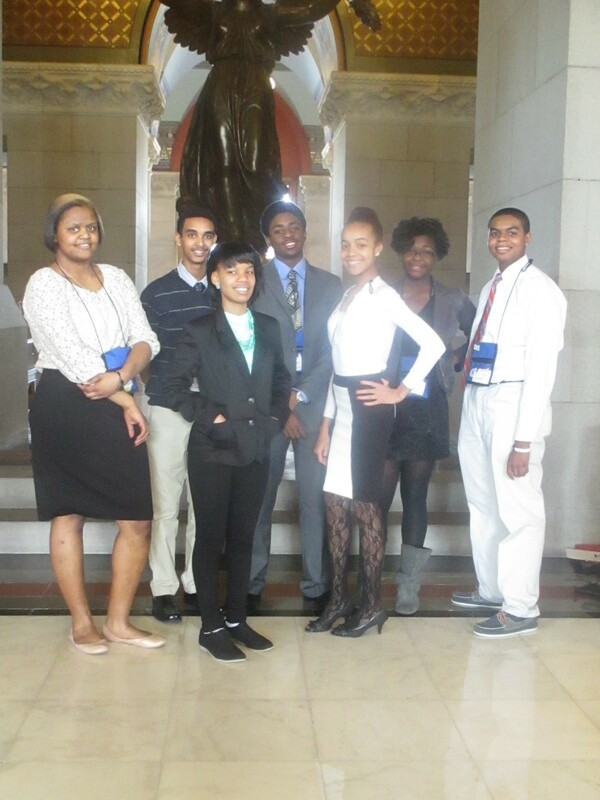 Our Youth & Government Youth Achievers recently participated in the state wide Youth & Government Conference wherein they acted as a mock government. This program is very unique as students from across the state of Connecticut hone in on their public speaking and debating skills. It is a weekend long conference at the State Capitol. 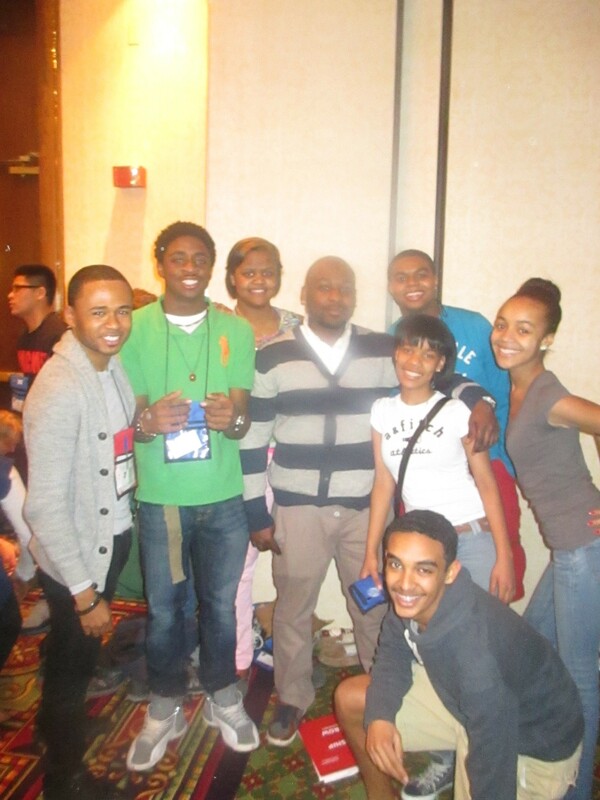 Prior to the conference, our Youth Achievers met regularly writing bills that they deemed important. They wanted to make changes to a number of the current laws. They have written bills that focused on gun laws, under aged drinking, and more police representation in our schools. These are dedicated and passionate youth who care about the well being our country. Their bills are presented to those who are in the House and the Senate. They have to opportunity to persuade others to pass their bill through those forms of government. I am pleased to inform you that we had two great Senators on our delegation, Chazeray Briscoe and Zaria Langs. Chazeray’s charismatic personality and great debating skills awarded him the conferences “Outstanding Speaker”!!!! 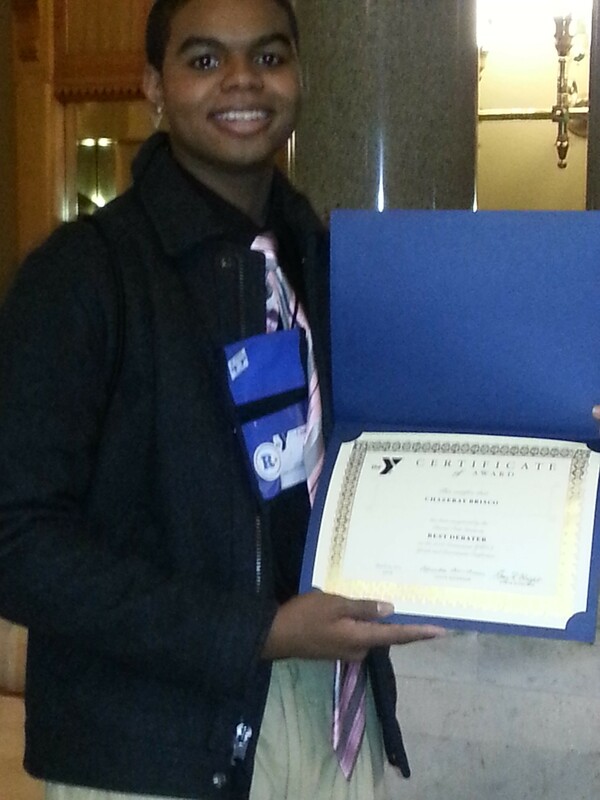 Way to go Chazeray!!! Let’s continue to support or future leaders!!!! Got Magic? Camp Jewell Does. Unlike most of the staff at Jewell, I didn’t get the chance to experience the joys of summer camp as a child. In England, where I grew up, there is no such thing as summer camp. Instead, I got to spend my summers running through Sherwood Forest pretending to be Robin Hood. My first camp experience was as a 19-year-old traveling overseas—like all of our international staff—to spend the summer in the USA working with kids as a counselor. I still remember arriving as if it were yesterday; I was getting off a plane at JFK airport after the longest flight of my life and driving what felt like the length of England to get to camp. And what a magical place it was. The camp was part of the YMCA of Greater New York and those short 10 weeks changed my life in more ways than I could ever have expected. For me camp was a magical place because just like the campers, I got to experience so many new things and make so many friendships. Over the years, first as a counselor and then as a village director, I got to see kids grow in so many ways. Those young six-year-old campers grew year by year in their self-confidence and independence. For many of the campers it was their only experience outside of the city, and to them a night sky full of stars was the most amazing thing they had ever seen! Yet, I also grew. 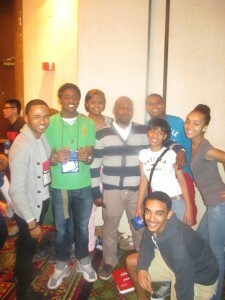 I became a leader, growing in self-confidence just as my pocket full of songs and skits grew! I knew this was what I wanted to do with my life, the positive impact that camp had on the campers and staff was the most powerful thing I had, and still have ever seen. After graduating from college I taught outdoor education at the same camp in New York for two years before moving to Wisconsin to work at several YMCA camps and the corporate office of the YMCA of Metropolitan Milwaukee (imagine how much fun having a camp person in an office can be!!) Despite the different positions I held, camp was still my passion and even though I might not have been able to sing so many songs I still could see the good that we do! And then at the end of 2011 I had the opportunity to move back east and come to Jewell. In this role I get to have the best of both worlds in that I have to make sure we run the best camp possible, and ensure the campers all have the best experience, and their best summer ever. Now, instead of having my own cabin of campers I now get to have a “cabin” of 150 staff members—it’s my job to make sure they have the resources and support that they need to make sure that each of the 1400+ campers that attend Jewell each summer have the kind of experience the campers had when I was a counselor. It’s hard sometimes for the staff to understand the impact they truly have on their campers. It is only over time when they enter the real world and their campers become adults, too, that they can really see how that two weeks one summer so long ago impacted children’s lives moving forward. So my story is different from the lifers here at Jewell because I came from a different camp and a different YMCA, but for all of us it’s the sum of our experiences that help us make camp such a special place to live, work, and play! For me camp is kind of like a firefly. What truly makes fireflies special is not just their bright light dancing across the athletic field as the sun starts to set over Sunrise Mountain, but that they are only around for such a brief time. If they were always around they would no longer be so special. That time is magical just like camp, and I believe every child should have the opportunity to attend camp even if only once in their childhood, as those bunkmates they make that summer will truly become friends for life! Go Ahead, Punk…Make My Day! I’ve always considered myself a pretty thoughtful person. It’s always been my practice to tell a stranger that I like their haircut or pay the toll for the random car behind me. But I fall into the same rut as everyone else; walking by stranger after stranger without a greeting or looking down at the floor as someone approaches. Starting work back at the Y, however, has gotten me out of my rut and has reminded and reaffirmed my belief in (I hate to be cliche, but) random acts of kindness. Now, hardly a person gets by me without me greeting them with at least a “hello”, asking someone who looks lost if I can help them, or engaging in a conversation about someone’s weekend. It’s what makes me love where I work and the members and staff with whom I spend my day. But that’s the the reason for this post. Anyone can “act” friendly for their 4-8 hours a day. What is really cool is that when I finish my day at the Y and go to the grocery store or Target or wherever, I continue to say hi to people as they pass by, or offer to help someone reach something off of a high shelf. And the best part is: THEY SAY HELLO BACK! Most often with a smile but sometimes with a look of complete shock or confusion as to what might be wrong with me. This weekend was great, as I was in the grocery store and overheard a young couple (couldn’t be more than 20) shopping and the girl said, “I should have gotten a basket.” I walked past them and when they turned the corner at the end of the aisle, they just about bumped right into me. As I handed her an empty basket that I had picked up for them and told her, “here you go”, you would have thought that they were just told that they had won the lottery. “Thank you sir”, he said (though I could have done without the “sir” part), and I could hear them whispering as I walked away. I have not written this post to boast about what a great guy I think I am, but to relay my thought that working within the YMCA community is not just a job nor is it a stage where the employees “act” happy and friendly then leave and go on like everyone else. I truly believe it is a lifestyle. It is a place for people to visit and work who want to be a part of a community. Who want to be in a positive, nurturing and social environment. And if you come into my Y not feeling this way…you better believe I will do my best to make sure you leave feeling better about yourself and your day!